The SSE Airtricity Moycullen Superleague squad pictured with the Greene family from Oranmore after participating in the second annual Donie Greene Memorial Tournament, held in Calasanctius College in Oranmore at the weekend. Galway basketball fans are in for a real treat this weekend as the 2018-2019 Basketball Ireland Superleague season kicks off with a bang as Moycullen host local rivals Maree in the season opener at 7.30pm in NUIG Kingfisher this Saturday evening. Moycullen will be looking to build on their successful season last year when they finished with nine wins in the league and were in the hunt for the play-offs right up to the last third of the season. This year the club has been boosted with the signing of new American Isaiah Harris-Winn for the season, while Maree have added American Sean Sellers to their ranks, and both players will be key to their respective side’s hopes for the season ahead. Hailing from Baltimore, Maryland, Harris-Winn comes to Moycullen having spent the last four years playing for East Mennonite University in the Old Dominion Athletic Conference. He enjoyed a stellar career with East Mennonite, averaging 15 points and eight rebounds per game last year. He made his debut in the Donie Greene Memorial Tournament last weekend when he gelled well with the team, while also posting impressive numbers. With his excellent shooting range and explosive moves, he is sure to be a favourite of the Moycullen faithful. There are a few changes from last year, but the core of the team remains the same. Back for another year are veterans Dylan Cunningham and Cian Nihill. While only young in age, Sean Candon, Kyle Cunningham, Patrick Lyons and Joseph Tummon bring years of experience at this level. Connor Curran is also back, as are James Lyons and Paul Kelly, who made their debuts last year. Making his debut this year will be Dara Kenna from last year’s U18 team and he will be joined by fellow rookies Joshua Marvesley, William Onyenweson, Daniel Arimoro and James Connaire. Having had a good pre-season the team will be hoping they can start the season off with a win on Saturday. The teams met on three occasions last year with Moycullen holding a 2-1 advantage - the first game being an historic one for Maree as they hosted Moycullen in their first Superleague game. The two clubs also warmed up for their season-opening Galway derby when competing at the second annual Donie Greene Memorial Tournament in Oranmore last weekend. 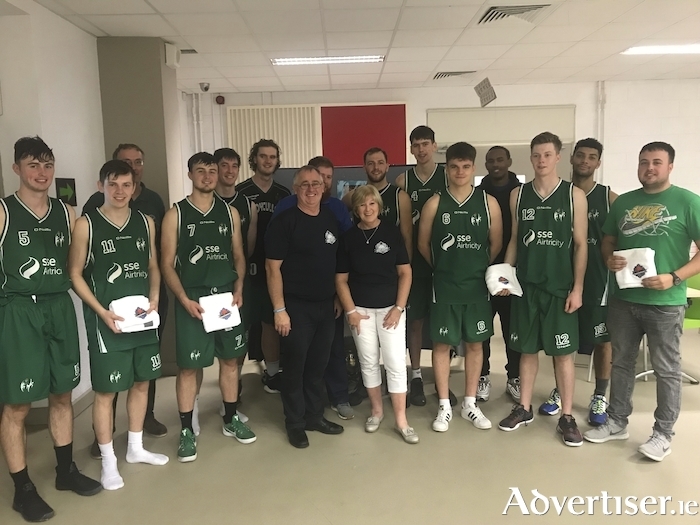 The tournament, held in memory of former Maree BC player, Donal ‘Donie’ Greene, saw the two Galway sides face Belfast Star, and the Dublin duo of Templeogue and Swords Thunder in a five-team round-robin format. The Galway sides got the tournament underway on Saturday morning, with Moycullen claiming a morale-boosting 71-53 win ahead of this Saturday’s league showdown. Belfast Star won all four of their games, but were unable to play the final, so it was left to defending champions Swords Thunder to take on host club Maree for the cup, and the Dublin side retained their crown with a 78-64 win. As with all derby clashes Saturday's opening night of the new Superleague is expected to be a tense and exciting affair.